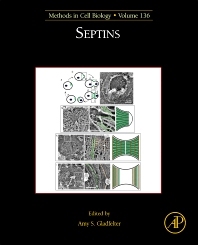 Septins provides established septin and molecular and developmental biologists and researchers new to the field with proven, state-of-art techniques and relevant historical background and theory to aid efficient design and effective implementation of experimental methodologies. Topics include the purification of septin proteins from diverse systems, their visualization in live cells, and their analysis by a variety of cutting-edge microscopy approaches. Dr. Gladfelter studied Molecular Biology at Princeton University, spending her freshman year researching electrophysiology on mammalian tissue with Dr. Simon Lewis at UTMB-Galveston, followed by genetics with Toby Bradshaw at University of Washington. Dr Gladfelter worked at Princeton in Bonnie Bassler’s lab studying bioluminescence in marine bacteria in the early days of quorum sensing. She then went on to graduate school at Duke University, drawn back toward the strong microbial and fungal genetics program. Here she began working with budding yeast S. cerevisiae in Danny Lew’s lab. Her thesis work focused on understanding how cells polarize and began with a focus on Cdc42 signaling. By analyzing a variety of Cdc42 mutants, she found a subset with defects in assembly of septin proteins. This began an interest in this understudied aspect of the cytoskeleton that continues to this day in her own lab and is the theme of this volume. With the encouragement of a few key mentors, she went abroad to do a post-doc in Basel, Switzerland at the Biozentrum to work in the lab of Peter Philippsen. Peter had just tamed a new model system-a filamentous fungus-called Ashbya that provided many wide open questions and intriguing cell biology. Here, she began studying the problem of how nuclei sharing a common cytoplasm can divide autonomously, a problem that seeded the projects in her independent group at Dartmouth. Dr Gladfelter began her lab at Dartmouth in 2006, focusing on understanding how cytosol is compartmentalized and revisited her old passion for the septin cytoskeleton. Much of the work in the lab takes advantage of different fungal model systems-including budding and fission yeast, Neurospora crassa as well as Ashbya. Recently the lab has begun work on several mammalian multinucleated cells including muscle. She has varied collaborations with modelers, biophysicists and microscopy developers. In particular, her work has been especially enriched by collaborations during the summer at the Marine Biological lab in Woods Hole, MA. In 2015, she was awarded the American Society of Cell Biology WICB mid-career award for research.